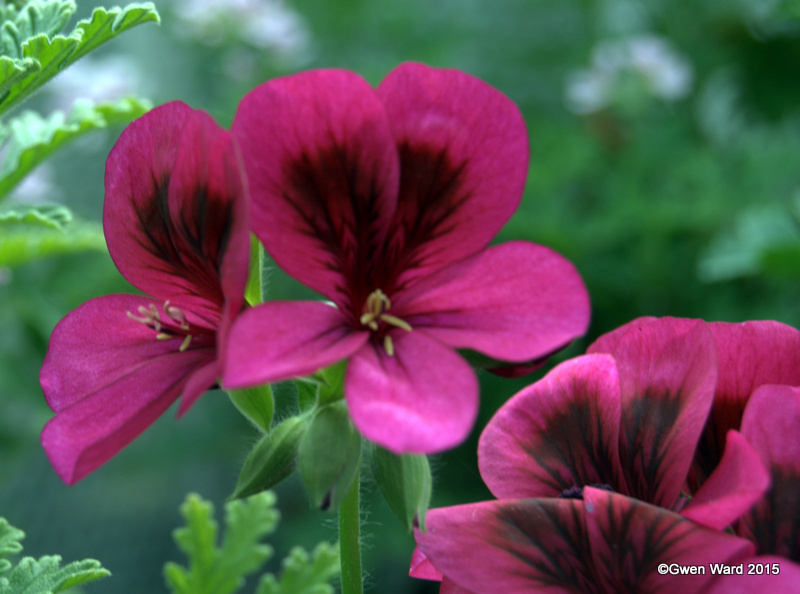 Those who know me will know that I am rather fond of miniature zonal pelargoniums. This is one that I saw at Fibrex Nurseries when I was visiting the National collection recently. 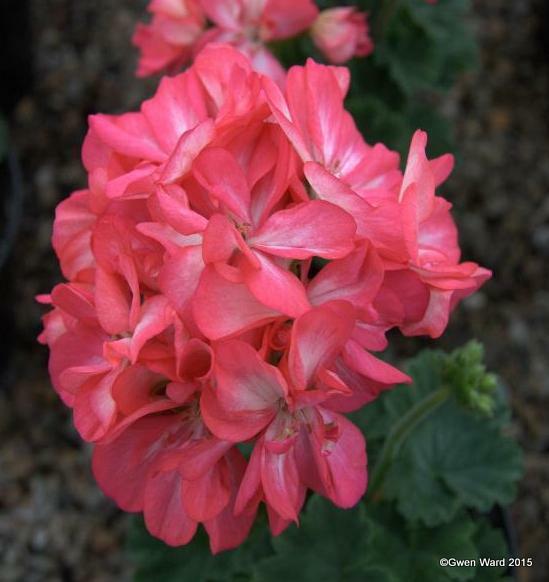 The miniature zonal pelargonum"Algenon" has semi-double flowers with carmine top petals with white centre, and paler 'tyrian' rose lower petals. The leaves have a faint zone. "Algenon" was introduced by Parrett in about 1964. 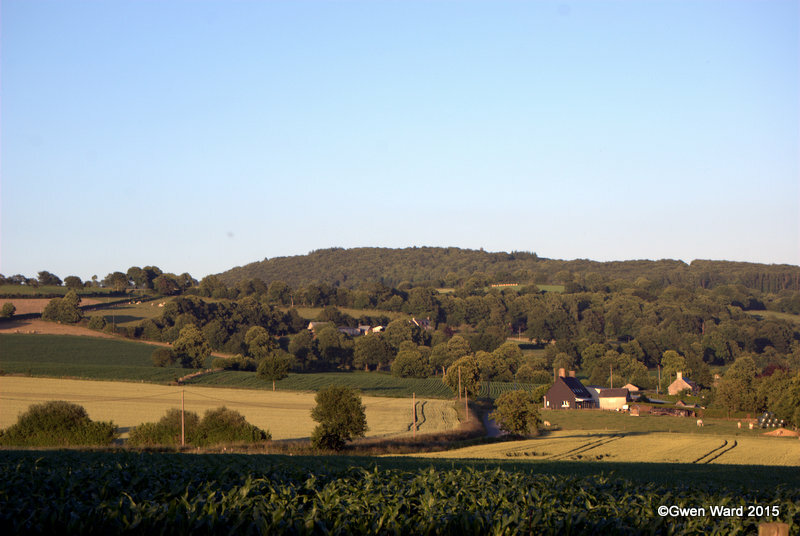 I am in Normandy in France this week enjoying some, mainly, lovely weather with husband Brian and cousin Sue and her husband, Malcolm. We have only had one rather dismal and damp day when we had planned to visit the Museum of Peace in Caen that day, and today is also rather dismal. The village is very small and very quiet, so not a lot to do. We have gardened, and enjoyed some relaxing times in the sunshine. We have done a bit of walking - not too far because both Malcolm and I have poorly knees, but we managed the circular walk of about a mile. I love this walk - so peaceful and surrounded by beautiful countryside. The highlight for me, though, is the nursery where the lane meets the main road at the top of the circular route where we turn to go home. 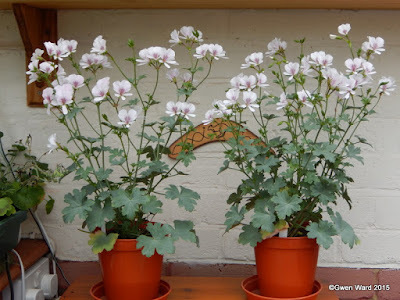 It is not a specialist pelargonium nursery, but they do seem to have a lot in stock. I love visiting this little nursery. An elderly couple had run it in the past, with two old dogs who roamed about. Although well kept, and well stocked, it did have a 'tired' look about it. I have bought pelargoniums there in the past to bring home and written about them here. 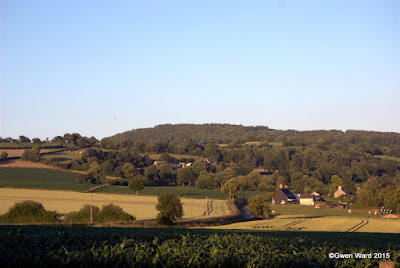 However, when we drove past when we first arrived we noticed it looked rather sprucer than it had done in the past. 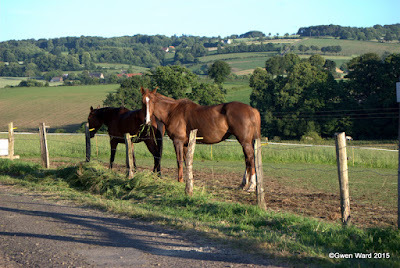 The first opportunity we had we walked our circular walk, camera's in hand, and took a quick look at the nursery. It was closed, but we noticed how much tidier and smarter it looked with many pots and baskets of flowers. The next afternoon, Brian, Sue and myself walked back to the nursery to have a good look. A young couple are now running this little nursery. The young man had excellent English (no need for our 'pidgen' French). He told us they had taken over the nursery in January 2014 and it was doing very well, far better than they expected. We were also pleased to see one of the original dogs still there. 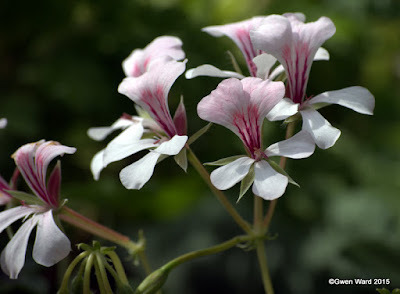 I spotted some ivy leaf pelargoniums that looked a bit different. Very pale pink with the top two petals slightly darker, and with feathering. Unfortunately they are not named. At 1€.10 each I could not resist buying two (bearing in mind we will have as full a car on our return as we had coming here). 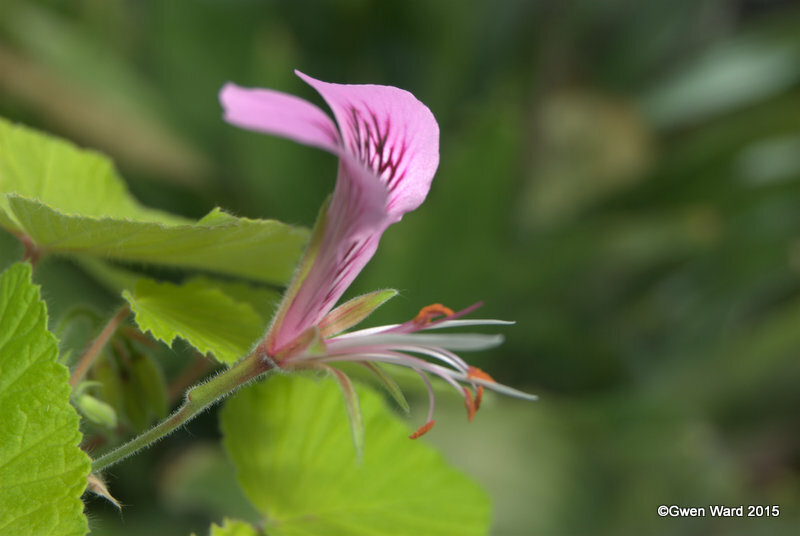 We then spotted some scented leaf pelargoniums, also unnamed, which I am sure are Concolor Lace (also known as Shottesham Pet, or Filbert). Sue and I had one each. Brian has a small collection of cacti at home and spotted one he thought was unusual, which also came home with us. We wish the young couple every success in their new venture. 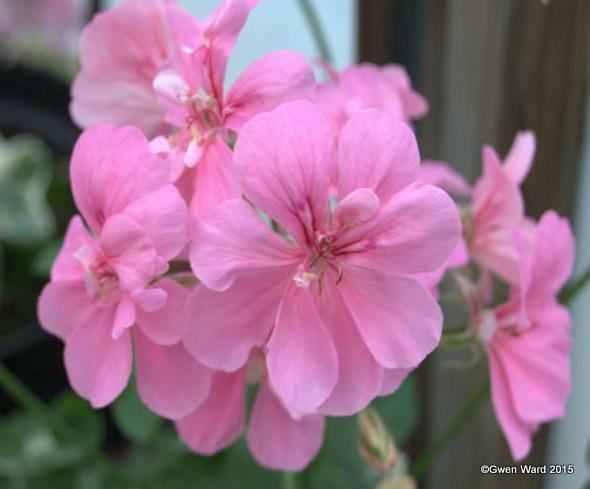 WORDLESS WEDNESDAY - 17/06/15 - ANGEL PELARGONIUM "BILLIE BARNES"
WORDLESS WEDNESDAY - 10/06/15 - REGAL PELARGONIUM "LARA DOREEN"
'Crockoday" - Ivy Leaf Pelargonium - and Club cuttings update. I spotted this in Allwoods catalogue last year and added it to my small order. I am rather fond of Ivy Leaf pelargoniums, particularly if they are short jointed and grow in a mannerly way. This one does and has become a favourite. On checking the Pelargonium Register I see that, although it is listed, there is no description. It does say it was introduced in the UK before 1988 by 'Day'. 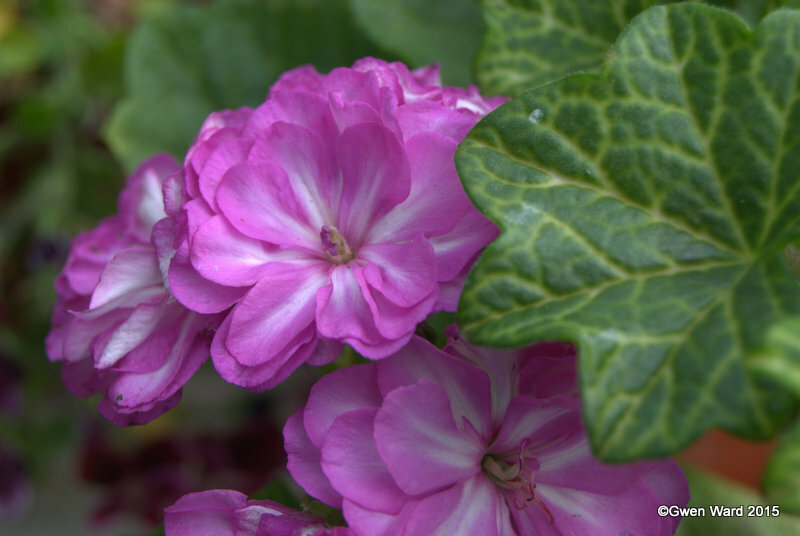 As you will see, the flowers are a beautifully bright lilac colour with splash of white in the centre of the petals. The leaves are bright green with light veining. I have the plant in a 41/2" pot and it has been flowering profusely for the past month (Note to Self: Pot up soon into 5" pot"). Sadly I dropped the pot (as one does from time to time!) and broke off two stems. This has, however, offered the opportunity for two cuttings which are looking good so far. The Farnborough Fuchsia & Pelargonium Society Club Cuttings which I have been growing on since I got them last February, have put on a huge growth spurt. They are flowering really well and I am sure you can now see what plant they are. Officially we are not told the name until after the show. It always amazes me at the difference there is in all the plants. We are all given a cutting of the same plant taken at the same time. 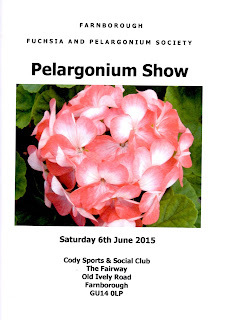 I am just hoping the flowers stay on until the Show, which is on Saturday 6th June. 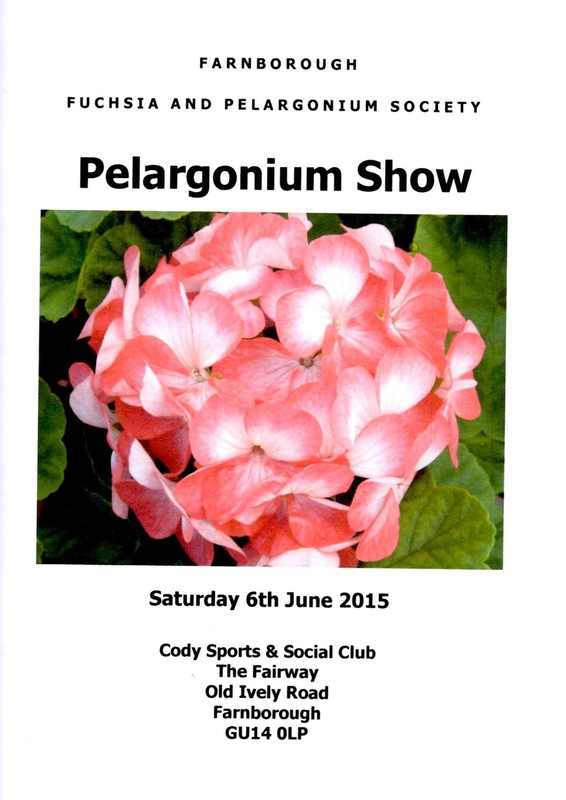 If you are in the area, do pop along and see us. 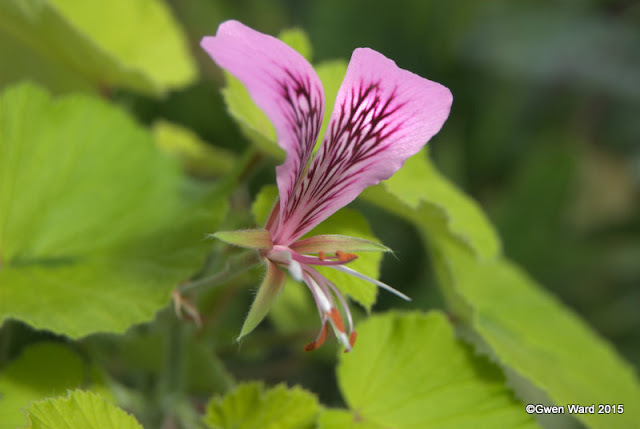 WORDLESS WEDNESDAY - 03/06/15 - "CAROLYN'S CITRINE"